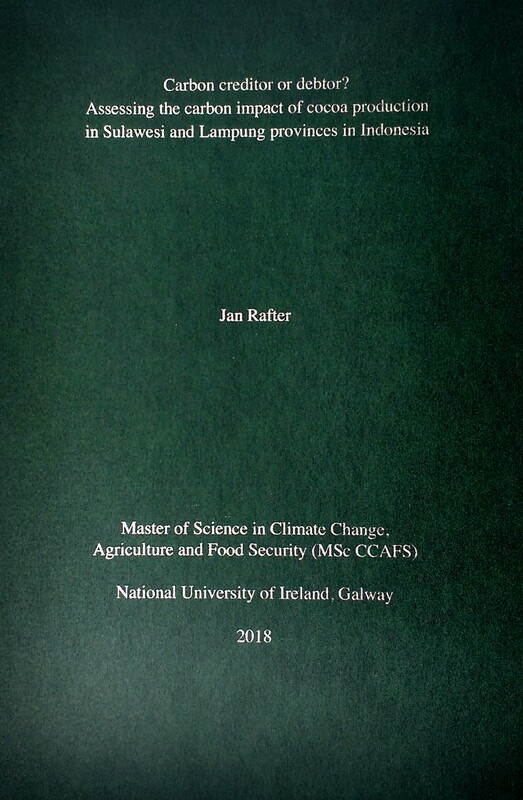 Following a busy few weeks of write-up and last-minute incorporation of results, my MSc thesis has been submitted! Though challenging at times, it has been an enjoyable and rewarding experience overall. 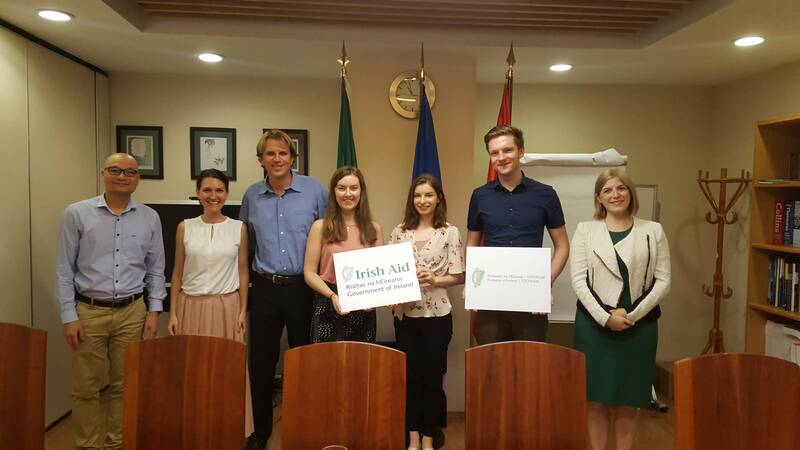 I’m grateful that I got the chance to carry out my placement in Vietnam, and my supervisors in CIAT and NUI Galway were supportive and encouraging throughout. Verification of remote sensing data is essential to calibrate methods and ensure acceptable levels of accuracy. For this research project the Terra-I remote sensing data was validated using government statistics on cocoa production and knowledge of CIAT colleagues. However field verification is normally the preferred and most accurate (though generally most expensive) validation technique. The below link is to an informative blog post about a field verification exercise carried out for Terra-I data in the Peruvian Amazon. 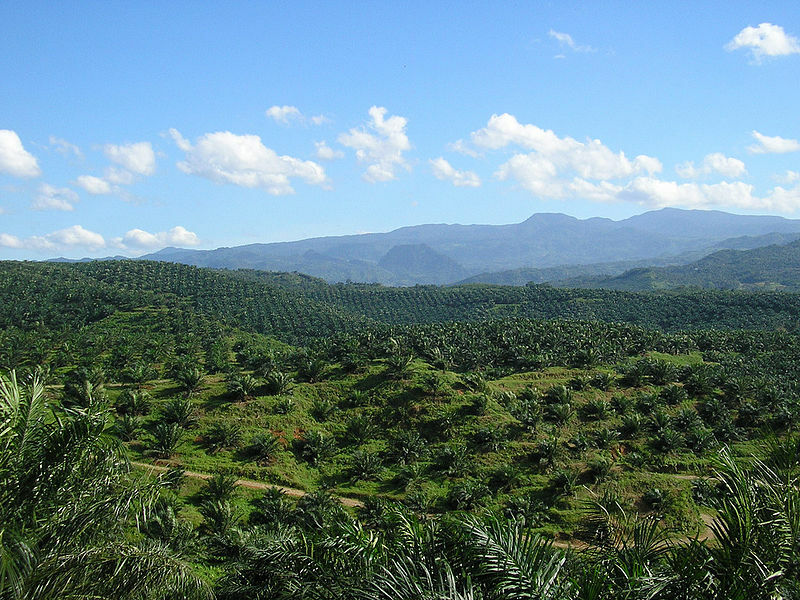 The data to be validated included over 25,000 ha of land cover loss from between 2004 and April 2015. The verification exercise used Terra-I data for 2013, 2014 and 2015 to define 65 sampling points and then using three buffer zones, randomly selected pixels for field validation. This week I got data on cocoa farm areas and primary and secondary deforestation figures for Sulawesi and Lampung and presented a quick assessment of these results to CIAT at a lunchtime presentation yesterday. 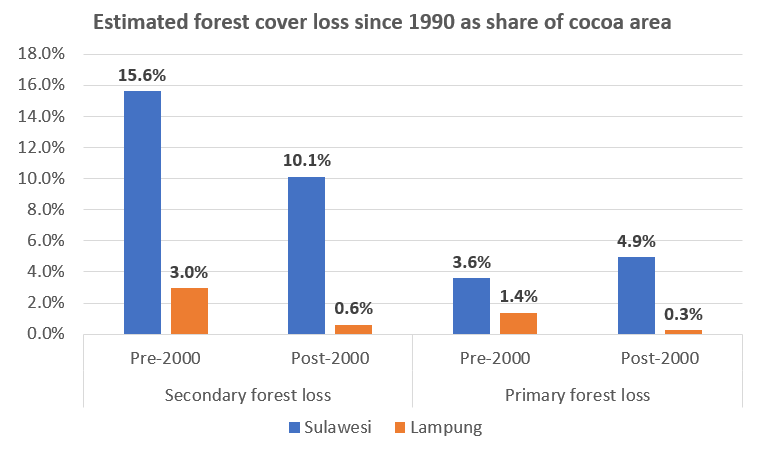 I will spend more time over the coming days examining the data but this quick assessment (see figure below) showed that about 35% of cocoa areas in Sulawesi were located on areas that were deforested since the 1990s, compared with only about 5% of cocoa areas in Lampung. There may be many reasons for this, which I hope to explore a bit more once I have the Sulawesi data broken down into the four provinces. The recent spate of wildfires in Ireland following the heatwave are a reminder of how the climate and weather is changing and how it is affecting efforts to protect forests in Ireland. Even the best laid plans to protect forested areas can be brought down in mere days by uncontrollable wildfires. Prolonged hot and dry spells were once a rarity in Ireland but are becoming more frequent and with it come more favorable conditions for wildfires. The biggest of the recent wildfires was in the Slieve Bloom mountains on the Laois/Offaly border. It had a front of over 4.5 miles and burned for more than a week. Although the full extent of the damage is not yet clear there are estimates of 180 hectares destroyed from this fire alone, with loss of habitats and release of carbon dioxide into the atmosphere slightly more difficult to quantity. Time has flown and I’m into my final two weeks at the CIAT office. At the start of the week I had a discussion with the Terra-I team about the challenges and timeline for the national level cocoa classification, given my limited timeframe remaining. I’m hoping to get some cocoa probability maps from them this week. From the trial runs carried out for the Lampung province, it has been found that the automatic classification system is working quite well at the lower probability end of the cocoa classification. 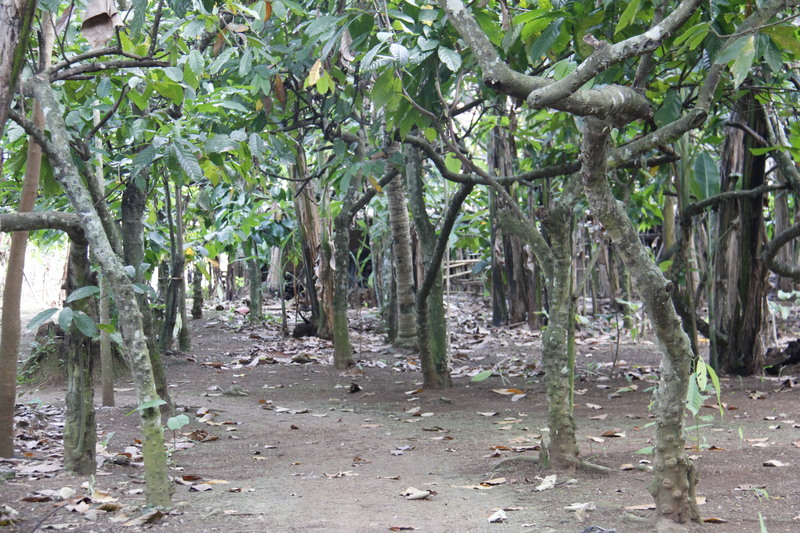 However, at the other end of the scale (positive identification of cocoa), rubber and coffee plantations seem to be the most problematic confounding systems in this region. Coffee and rubber was identified as one of the four most likely confounding systems prior to starting the system training exercise. See figure below of the image interpretation key of the four confounding systems used in the supervised classification. A trial run for automatic classification of cocoa in the landscape was performed for the Lampung province last week by the Terra-I team. This was following a number of supervised classifications of cocoa which were used to train the system for automatic classification. The output provided a better understanding of how the system is currently working and how it can be refined. I have a better idea of how the final output is likely to look for my research objective of estimating the spatial distribution and areas. The system is currently set up to identify cocoa within ranges of confidence, see output image below for Lampung with the areas in blue being the least likely to have cocoa and red being the most likely. 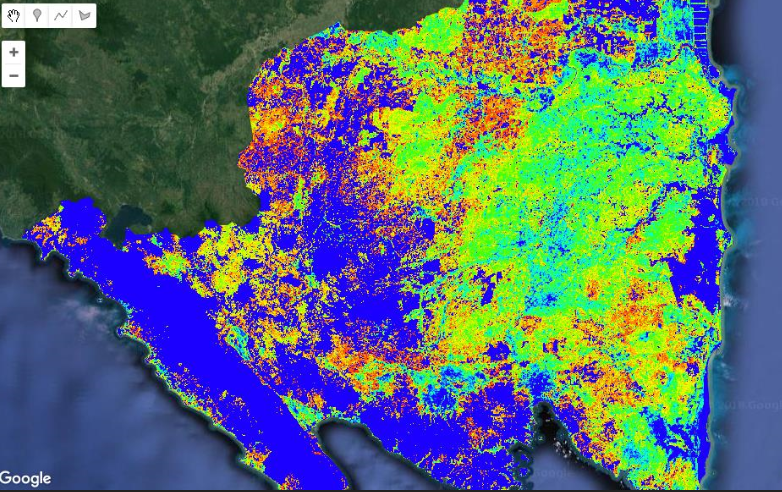 Following on from the last few blog posts, a third technique for estimating aboveground carbon stocks is through remote sensing. 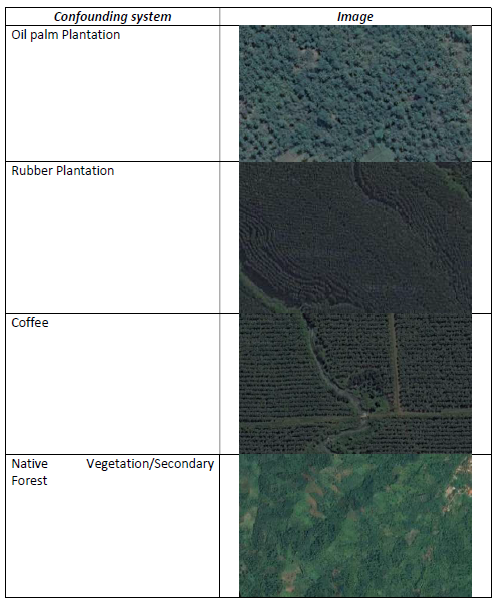 Remote sensing has relevance for my project since we are using it to identify cocoa farm typologies at a large (national) scale and I will indirectly use it to classify the carbon stock of those typologies.